Reservations of winter 2019/2020 should be done now ! 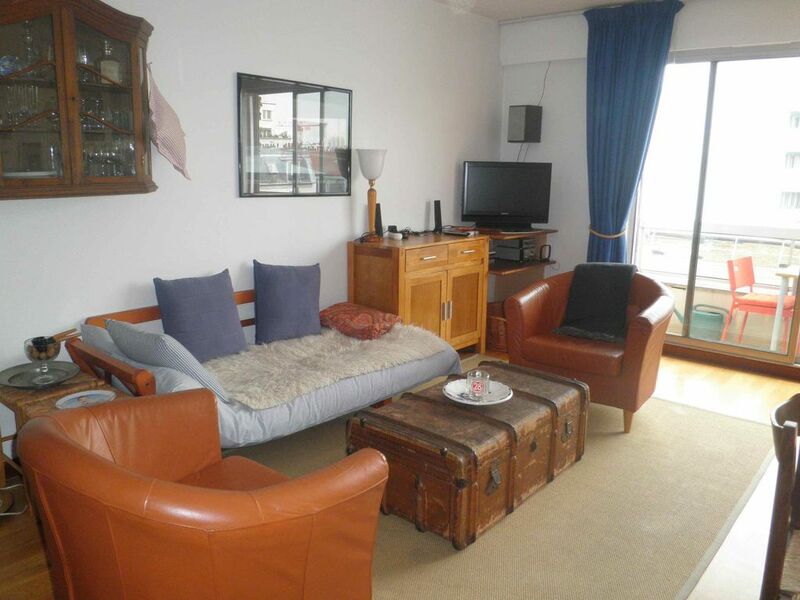 I am sure that you will like the bright apartment that I propose in the Bastille district, close to the Seine and to many activities and sights, but entirely quiet in a hidden small street. It is a comfortable and 'cosy' apartment with a balcony. It includes a large living room, 1 bedroom, bathroom with bathtub, separated WC. You will have all the necessary comfort with a well equipped kitchen, washing machine, free Wi-Fi. You have 4 subway lines, several bus lines and bicycle rentals nearby. I am German-French bilingual, and fluent in English. Before on-line renting please ask me any other information that could be useful, including paiement détails (advanced paiement ? rent for more than a week ? ...) in order to decide yourself ! Please give me also some informations about yourself, I appreciate to know something about my guests. I am german, living in Paris since 40 years, retired but feeling young, I love to walk, to use my bike, movies, and to make you love Paris. The main points : It's such a bright apartment, with big windows and a look into the sky. No noise, nor inside neither outside. Perfect to have a good sleep after a long tourist day. This apartment has everything you need for an excellent stay in Paris. It is very close to the metro which will take you anywhere in the city. Many tasty food options close by and a grocery store only a two minute walk away. Sabine was a pleasure to work with. I would definitely stay here again on my next visit. Great location and wonderful light entering the apartment. Nice kitchen for cooking things from the Bastille market. Quiet as well and very safe. Everything we hoped for. Great quiet location. Close to many sights. We spent 13 days in Sept/October. It was perfect for us. 5 minute walk from the Bastille market which supplied many of our meals. Well stocked kitchen. Comfortable bed. 5 min to 2 metro stops. Hope we can stay there again some day. My wife and I spent two weeks at Sabine's apartment and could not have been happier that we did; it was perfect for us. The apartment is fully furnished, very comfortable, plenty of hangers in the closet, and the kitchen is just the right size. Paris is a large place, with so much to see and do, so the metro is a necessity; it is just a short walk a way around the corner. Around the other corner is a fully stocked market; and of course there are plenty of good restaurants nearby. The neighborhood is very quiet and sleeping was easy. There is a wonderful street market every Sunday and Thursday and it is not even a five minute walk to get there. One very important thing: the elevator worked perfectly. We are already planning our next trip to Paris, hopefully next year, and this is where we will stay. Thank you once more, Sabine, for all that you did to make our vacation so very special! We spent a nice week in Sabine’s apartment, in the first week of September. Sabine kindly allowed us a Thursday to Thursday rental.. It’s bigger than most in the price bracket, and the location is excellent- close to the metro, shops and only a relatively short walk to the Marais and central Paris. There is plenty of living space in the main room. It’s a modern clean apartment, so the plumbing, kitchen appliances and hot water work like a charm: no surprises. The street is one of the quietest we have stayed in, which is a big plus for us light sleepers. And the nice balcony is a real plus. The kitchen is well equipped- no microwave or dishwasher, but they are really not needed. Please be aware that this is the owner’s personal residence. So there are a lot of possessions present in the apartment. This may not be to everyone’s liking, but should not be a drama- except for limited luggage space (if you carry lots of baggage like we did!). It’s fair value for Paris and has the plus of location, quietness and room. Sabine is a very accommodating and flexible owner! She also speaks excellent English. Consider this above the selection of studios you can find at the price bracket. this is much better value and certainly more comfortable. Merci pour votre votre appréciation. Je trouves toutefois un peu dur d'enlever une étoile. Par rapport à quoi ? Qu'il manquait de la place pour les bagages ? J'ai du mal à comprendre, car votre appréciation pour le reste est tellement positive, qu'on pourrait s'attendre à 5 sur 5. I stayed at this apartment for 6 nights at the end of July 2015 for a solo trip to Paris. Making arrangements for my stay was easy as Sabine responded to my initial inquiry and follow up messages promptly. When I arrived in Paris, I found the apartment easily after a train and metro ride into the city from CDG. I met Line, the caretaker, paid the fee up front and received the keys. The apartment was safe, clean and had all the amenities I needed- Wi-fi, TV, full kitchen, and washing machine were all appreciated. The balcony was also a plus. This apartment is in a great central location near multiple options for public transportation and getting around the city to all the sights on the metro or on foot was easy. It less than 5 minutes to the Richard Lenoir stop on the orange no 5 Metro line and it is 1 block away from a good grocery store. When I was done sightseeing and needed a place to relax, it was a nice place to spend time. It has a real bed that was quite comfortable (not a futon like a lot of the other budget conscious options). One thing to note is payment must be made in cash, which was easy enough to plan ahead for. There are some older residents in the building so I would not recommend this apartment for people looking to party, but this is a good option for 1-2 people looking for a quiet place to stay and I would stay here again. Thanks Sabine and Line! The nearest underground stations are Richard Lenoir, on line 5, and St. Ambrose Station on line 9. Markets are held four days a week. You will be ideally situated to explore Paris on foot.